Trigger Warning: Tissues might be needed. When we found out we were pregnant we were ecstatic. Our first attempt had not worked out so well, as many do, and my wife had a miscarriage. We heard those words and they did little to assuage the guilt, the questioning, the self doubt. So when we fell pregnant again a few months later we were overjoyed, but apprehensive. What if it happened again? What is there was a problem? But as time passed and we passed the first trimester we felt more comfortable, more confident in what was going to happen next. We did what most expecting parents do and headed out shopping, planning how we would decorate the nursery, and enjoyed our last few weeks of just us. This talk is eight years in the making and tells of what happened next. When I pitched it to the FemInEM team I was sitting in the sunshine outside the state library, just talking to my phone. I wasn’t expecting to get accepted to speak, but am really grateful to Esther, Resa, Dara, Jenny and the gang for listening. I wanted to talk about parental presence in Resus but from a different angle. From the side of the parent. In medicine we are truly privileged to be there at the beginning and at the end. We should never forget that these days will be remembered for the rest of our patients lives. How we spend those moments will be looked back on and reflected upon for a lifetime. In those times of greatest darkness we can shine a little light. 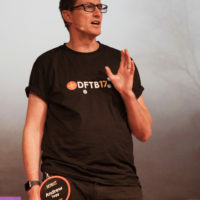 Watch Dr. Tagg’s FIX18 talk below!